Abbie is my 10 year old lilac point Siamese. I didn't choose her - she chose me. We had the pick of eight kittens and she rushed up to me, climbed up my leg and into my arms, and purred. I was won over! Since then she has ruled me completely. I have owned Siamese cats all my life but never one like Abbie. She is very clingy and demands attention day and night. Sadly she lost her brother two years ago, and since her brother passed she has slept in bed with me and hubby. Lately she has been restless at night and has this habit of circling my head and head butting me for ages. We have a year-old Ragdoll and let me tell you Abbie is more active than he is. Oh yes, she is sharing my chair as I type! I love Siamese! 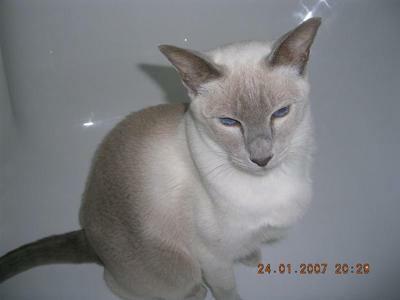 Thanks Jenny for your picture of Abbie - she's a beautiful example of a lilac point Siamese and good to see, as we don't get too many lilac points visiting us here - or blue point Siamese, for that matter. She sounds like a real character and a very typical Siamese!